A full train horn system, ready to install. 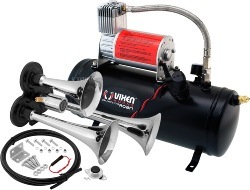 At the heart of this package is the intense triple trumpet air horn, drawing immediate attention. Chrome look, made entirely of metal for maximum protection against all weather conditions. This system includes a 1.5 Gallon air tank, 150 PSI 12 volt air compressor, pressure gauge, pressure switch, hose, fittings, horn button and mounting hardware. Ideal for all vehicles with a 12V system. A bold, loud choice. Dimensions (L x H x D) 17" x 12" x 6"